In this second novel of the Dreamlight trilogy from New York Times bestselling author Amanda Quick, psychic power and passion collide when a legendary curse ignites a dangerous desire. The Arcane Society was born in turmoil when the friendship of its two founders evolved into a fierce rivalry. Nicholas Winters’s efforts led to the creation of a device of unknown powers called the Burning Lamp. Each generation of male descendants who inherits it is destined to develop multiple talents—and the curse of madness. Plagued by hallucinations and nightmares, notorious crime lord Griffin Winters is convinced he has been struck with the Winters Curse. But even as he arranges a meeting with the mysterious woman Adelaide Pyne, he has no idea how closely their fates are bound, for she holds the missing lamp in her possession. But their dangerous psychic experiment makes them the target of forces both inside and outside of the Arcane Society. And though desire strengthens their power, their different lives will keep them apart—if death doesn’t take them together. 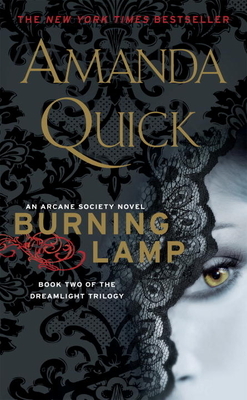 Amanda Quick is a pseudonym for Jayne Ann Krentz, the author of more than fifty New York Times bestsellers. She writes historical romance novels under the Quick name, contemporary romantic suspense novels under the Krentz name, and futuristic romance novels under the pseudonym Jayne Castle. There are more than 35 million copies of her books in print.